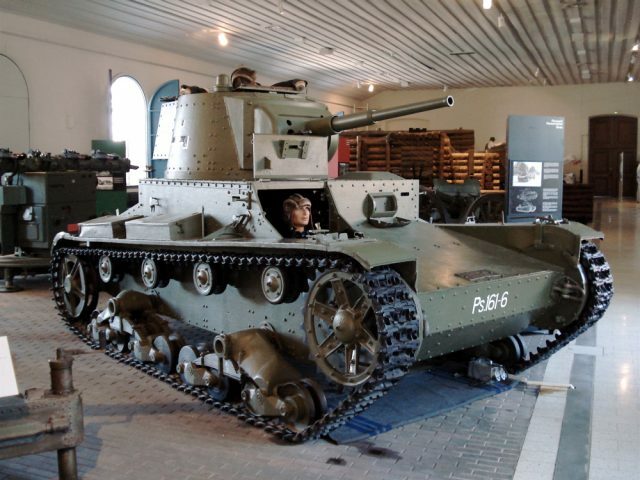 With the outstanding success of the Carden-Loyd tankettes, Vickers-Armstrong, the industrial giant of Great Britain, which had the means to produce and sell, with its network, any new vehicle, decided to create a light tank for mass export. This would become one of the most current designs worldwide, together with the French FT, and certainly the most influential light tank design of the thirties. It was built under license by several countries, including the Soviet Union, which fielded 12,000 T-26s prior to the July 1941 invasion. 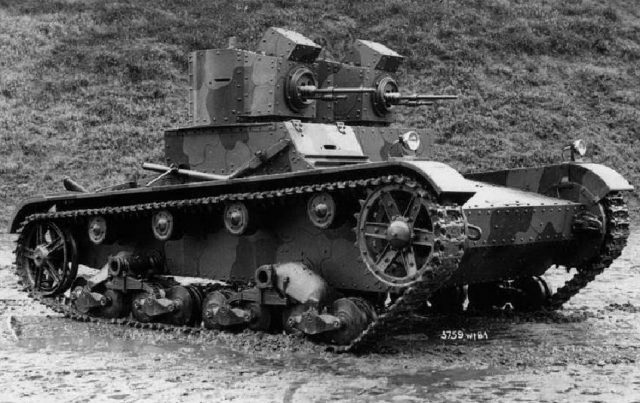 The Vickers 6-ton, also officially called the Mark E, was integrated into the British tank nomenclature, hoping that some official order would come. It was designed to be simple, reliable and versatile in its design, especially for the export market. John V. Carden and Vivian Loyd were part of the team gathered around this new prototype, which was, basically, a scaled-up, turret equipped tankette, with a new engine and suspension system. The hull was made of riveted plates, 1 inch (25.4 mm) at the front and less elsewhere, because according to the classical tactical theories of the day, it had to deal with infantry, and deflect artillery shells frontally. The powertrain consisted of the reliable Armstrong Siddeley Puma, a petrol aviation derivative design capable of 80-95 bhp or 60-70 kW, giving a speed of 22 mph (35 km/h) on roads and less on rough terrain. The hull was considered long enough not to use a steering tail for trench crossing. The suspension was made of two-axles, each with a pair of twin wheels bogies, connected by a classical, but efficient leaf spring. This system was probably the best around before the arrival of the Christie system. Two versions were considered from the beginning. Like the FT, machine-gun versions and gun versions had to be fielded together in operation. But the Vickers team choose an original approach for both versions. Instead of going for the usual turret arrangement, they took advantage of the wide hull to accommodate two small, one-man turrets, each operating a Vickers watercooled heavy machine gun. In trials, this version, called “Type A”, gave an excellent rate of fire, being able to cover a large area simultaneously. Such multiple turret arrangements, inherited from the concepts of the end of WW1, were still popular. But this feature, relatively complicated, was not to be followed. At the opposite, the famous “duplex mounting” of the Type B was a success, largely copied abroad. The Type B had a gun and a coaxial machine-gun within a two-man turret. This turret carried a low-velocity 47 mm (1.85 in) short barrel gun, in order to deal with fixed gun positions, machine-gun nests and casemates. This was a prime innovation at the time, and became a landmark in tank history. However, the short barrel was replaced, in most cases, by high-velocity 37 mm (1.46 in) AT guns. The excellent knowledge and coverage of local markets provided Vickers with many opportunities to sell limited numbers of its light tanks. The Mark E compared favorably to the French Renault FT in many aspects, including speed, suspension, endurance (with its high strength steel tracks), versatility and overall recent conception. The first client was the Soviet Union. They purchased 15 Type A twin-turret versions in 1931 and acquired a license for the Type B. Poland also bought 38 tanks in 1932, 16 Type As and 22 Type Bs. When ventilation problems became apparent, they modified the hull and influenced the design of the latter Mark F.
Portugal purchased two Mark E tanks, Greece four, Bulgaria eight and Bolivia three. These were used during the Chaco War, and two were captured by Paraguay. The twenty Chinese Mark E Type Bs and the thirty Siamese models all fought, respectively, during the Japanese attack of Shanghai in 1937 and the Franco-Siamese war of 1941. The faults of the Mark E engine made it clear that a new, less overheating engine, and better ventilation systems were needed. This led to a set of modifications including the Rolls-Royce Phantom II engine, which was water cooled and so big that it had to be fitted partly alongside the crew compartment, and the turret was subsequently displaced right aft. This was done mostly to fulfill a request from the Belgian army, but they rejected the prototype after extensive trials. However, the Belgian army adopted the Vickers-based T13. This Mark F was also built for Siam and Finland and became the new standard. The Finns modified their tanks, when the war broke with Russia, in order to mount to the Swedish 37 mm (1.46 in) Bofors. The Soviets, which had acquired the license, modified the basic design with a new turret and their own high velocity, long-barrel anti-tank 45 mm (1.77 in) gun, ending with the T-26, of which over 12,000 were built, including many sub-versions. 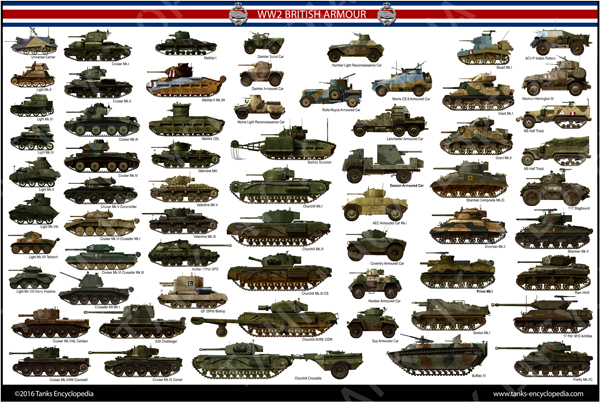 It became the mainstay of Soviet armor and was still the most common tank in 1941. The Poles also modified the design, adding a new ventilation system, Hotchkiss machine-gun, a 360 degree Gundlach periscope and a diesel engine. This 7TP became the most successful product of the Polish factories prior to WW2. Thirty Vickers 6-tons were bought in 1933-34 by the Siamese kingdom (now Thailand), and pressed to war in 1941 against the French colonial empire in Indochina. The French there possessed only twenty obsolete FT tanks, which were no match for them. By contrast, the whole Thai army fielded around a hundred tanks, which, besides the Mark E, were all Carden-Lloyd tankettes and amphibious models, well adapted to the landscape. Vickers realized a marvelous deal there, selling around 134 tanks and various military equipment varying from machine guns, field artillery, to rifles and ammunition. However, the French Foreign Legion managed to destroy some tanks with QF 75 mm (2.95 in) field guns in direct fire mode. The Republic of China came to buy twenty Type Bs and used them against the Japanese, notably during the battle of Shanghai in 1937. They didn’t survive the war. Other Chinese tanks used in 1937, with approximately the same pattern, were German Panzer Is and Russian T-26s, closely related to the Vickers 6-ton. Bulgarian standard liveries were khaki and gray. The Mark F was a heavily modified version to cope with ventilation problems of the overheating Armstrong Siddeley Puma engine. The Finns purchased 26 6-ton tanks Model Bs in 1938, and eight other modified F models later. They were all taken over in 1939, when war broke out with Russia, to be modified with the Swedish Bofors 37 mm (1.46 in) gun, which was far more potent as an antitank weapon than the regular short-barreled 47 mm (1.85 in). Only thirteen were ready before the war ended, participating at the Battle of Honkaniemi in January 1940. But this was a near-disaster, as most of these tanks were lost. Later, the Finns also managed to modify still existing models with Russian T-26 guns, high velocity 45 mm (1.77 in) models, which became locally known as the T-26E. They fought on until the end of WW2. The first Vickers Mark Es were model As, the twin turret model, armed with two liquid-cooled Vickers machine guns. This one was part of the only four machines retained by the British army for testing and training purposes. Many Type A vehicles were sold abroad, but they were by far eclipsed by the Type B. An early production Vickers E Type B, with the low-velocity 47 mm (1.85 in) gun. This one served with the Siamese army, which bought thirty Type Bs in 1933-34. They saw action in 1941 against French colonial forces, and duelled with the few French light tanks they encountered. Bulgarian Vickers Mark F. Bulgaria bought twenty Mk.Fs, a modified version of the Mark E, mostly for training purpose. They were still in service at the beginning of WW2. Finnish Vickers Mark F, modified with a Bofors 37 mm (1.46 in) gun. They only took part in one battle until the very end of the war with Russia in 1939. A Finnish Vickers Mark E Type B – Credits: Wikipedia. As of 16 September 2017, this article is missing an important area of information: the crew! It doesn’t break down the location and duties of each crew member.